I’ve been battling a cold for the past couple of weeks. Tonight I made the difficult decision to skip a show to which I already had tickets. Instead, I came home and continued to work my way through the frozen soup collection I’ve been amassing. On those winter days when it’s too cold to think about going out, I spend my time cooking up large batches of soup using whatever I have on hand. I eat it for as many meals as I can stand and freeze the rest. The plastic pint containers that you get when ordering takeout or buying olives are perfect for a single serving. The key here is to be diligent about labeling each container with the date and the contents. Tonight’s freezer exploration turned up a particularly tasty soup that I made back in January. I had hosted a cocktail party at which I served bagna cauda, a dip of butter and/or olive oil with garlic and anchovies. I like to add some red pepper flakes and parsley. You serve it warm (hence the translation: “hot bath”) with raw winter vegetables and hunks of bread for dunking. The bagna cauda paired brilliantly with both the Prosecco and the Negronis. The next morning found me with a headache, sticky counters, and a bunch of leftover fennel, endive and cauliflower. The vegetables were beginning to brown where I had cut them. Delicate spinach intended for a salad was also begging to be consumed. There are a few basic formulas for making soup. This one involves sweating the aromatics, adding the vegetables, gently simmering them in broth, and then pureeing the mixture. That’s it. The absinthe was a last-minute addition that took the soup to a new level. Tonight it almost made me forget that I am missing Beth Ditto’s performance. Hopefully a cough syrup nightcap will finish the job. Melt the butter with the olive oil over medium-low heat. Add the red onion and fennel and cook stirring frequently so that they do not brown. When the onion and fennel are soft and becoming translucent, add the garlic, fennel seed, cayenne, ginger and nutmeg. Cook stirring constantly for a minute or two. Add the chicken stock, water, endive and cauliflower and simmer gently until the cauliflower is soft. Add the spinach and absinthe and simmer for another 10 minutes – or maybe less. (You want the spinach to retain its bright green color.) Puree using an immersion blender or in batches in a food processor or traditional blender. Taste and adjust the seasoning as desired with salt, pepper, sherry vinegar and/or lemon juice. Ladle each serving into a bowl and garnish with plain yogurt, fennel pollen and the fennel fronds. 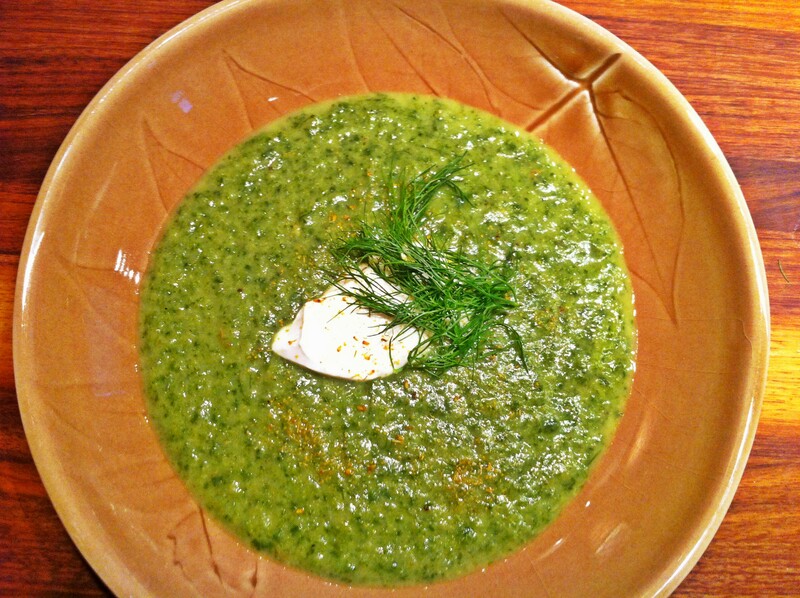 This entry was posted in soups & stews and tagged absinthe, cauliflower, endive, fennel, spinach by Jasmine Nielsen. Bookmark the permalink.